Suzuki's trail bike range has expanded for 2015 with the introduction of the DR200S. Suzuki is giving enduro riders even more bang for buck on their best-selling models. Suzuki is giving riders twice the choice with its dual-purpose DR650SE, with two liveries now available for Australia's best-selling, big-bore trail bike. Following a Motorcycling Australia rule change, Suzuki's RM250 motocrosser is eligible to compete in the 2009 Under 19s Australian Motocross Championship. Australia's number one selling big-bore trail bike, Suzuki's latest no-fuss DR650SE has landed down under, sporting a brand-new look. Suzuki’s 2008-model RM250 has landed in Australia, ready to unleash its potent combination of outstanding power and handling. 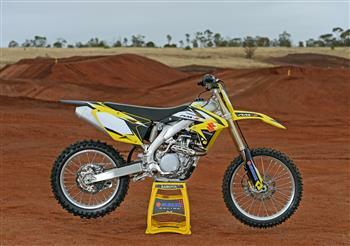 Suzuki Australia has released advance details of its latest RM125 motocross machine, due to arrive in October. Suzuki Australia has released preview details of the new 2008-model RM250 motocross machine, set to deliver outstanding power and handling on Australian tracks later this year.